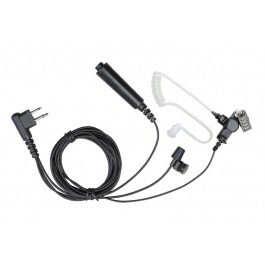 Based on how the microphone and earpiece connect to the walkie talkie connector, users can select between a 1-wire, a 2-wire, or a 3-wire surveillance kit. 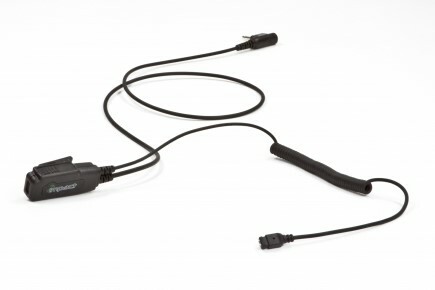 When the two-way radio accessory has one wire leaving the radio connector and if the ear piece portion is connected to the microphone in any way, matter, or form then you have a 1-wire accessory. On a 2-wire, the ear piece portion and the microphone portion of the radio accessory each have their own wire as they leave the radio connector. 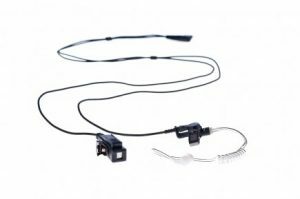 Some companies offer surveillance kits that have a wire coming out of the microphone instead of through the microphone. 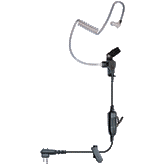 They call this a 2-wire kit, but when you use it, you quickly realize that the microphone must stay within a certain distance of the earpiece. This limits the user friendliness of the true 2-wire accessory that allows the microphone to be placed anywhere the user needs it to be for easy reach. With the true 2-wire surveillance kit the microphone can also be routed through a shirt or jacket, allowing the user to place it where he or she finds it most comfortable. The 3-wire surveillance kit has three wires coming out of the radio connector. One wire for the microphone, another wire for the ear piece, and a third wire for a PTT button. The user can wear the PTT button in many locations that can be discretely pressed to make a radio call. Surveillance kits are also available in two kinds of cable coverings: Braided Fiber Cloth or Regular Plastic. The plastic cable covering is the most common. The new braided fiber cable covering has gained a following as it seems to not tangle as easy as the plastic covered cables. The braided fiber cloth covered cables also have a higher strength and durability rating due to the fiber having Kevlar threads interwoven with the fabric. 1, 2 and 3-wire surveillance kits are available for all makes and model of 2-way radios. You do not have to worry if you own a MOTOROLA, HYTERA, Kenwood, ICOM, HARRIS, or other brand of two-way radio. Even if your radio has been discontinued, a connector to fit your radio will generally be available. Still have questions, Metrotalk can help! Call us at 1-800-268-4098 or contact us today!